You know the feeling wanting to go on holiday to Portugal but being stuck in Antwerp? Here’s an alternative! Get yourself to the north of Antwerp and immerse yourself in the Portuguese community; bakeries, bars, restaurants and of course… Estrela do Mar. When you get into the bar just ask the waitress if they have a table for you, even if you don’t see a free one. She will take you to the restaurant in the back. When you get seated, take a good look around and you will notice that Estrela do Mar – starfish – is the overarching theme. There’s no menu here; she will tell you what they can prepare that day and if you’re lucky there will still be 4 dishes left for you to choose from; fish, steak, maybe gambas or sardines with a salad and French fries or rice. Even the wine is easy to select: red or white? I love it! Don’t forget to ask for the desserts, they are to die for, chocolate pie, profiterole pie… sweets and sugar it is! 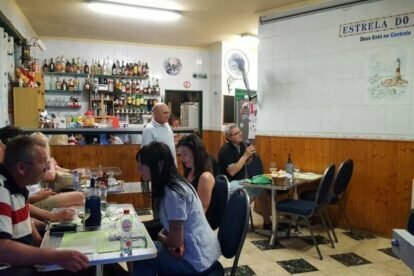 To pay, you go to the bar in the café, wait for the owner to finish his karaoke song – he loves karaoke – and pay very little money for a royal dinner.